It's our honor to recognize one of our most treasured Eagles; Nancy Rafferty. One would be hard-pressed to find another community member that gives so greatly to the District and Elementary School. Nancy, when she's not with her family or watching her Cubbies, is a regular face at the Elementary School. The students' eyes light up with joy when they see her strolling down the hallway with her iconic bag of books. They know exactly what that sight means. It means that its story time with Mrs. Rafferty! Nancy has read hundreds of hours worth of stories to the students of Schoolcraft Community Schools and it is partially for that contribution, of her time and passion for reading, that she is being recognized tonight. Another gift Nancy shares with the district is that of her hospitality and good cooking. A lucky number of staff members are invited annually to Nancy's house for her famous Lasagna luncheon. For those lucky enough to join her, its a treat they'll never forget! Nancy also gives to the district and community through her role in the Schoolcraft Historical Society. She is a wealth of knowledge and shares that freely with our students and teachers every year through the Underground Railroad House and, more recently, a Strategic Partnership project with our middle schoolers. 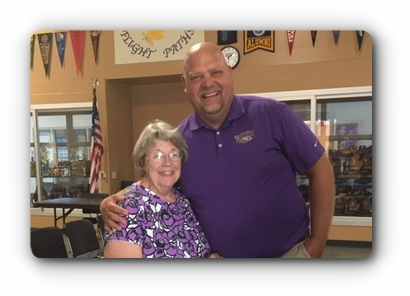 Lastly, Nancy's commitment to Schoolcraft Community Schools and it's excellence for education has led her to participate in various groups and committees over the years. Mrs. Rafferty's input and guidance will surely mean that SCS will continue to grow to meet the needs of future Eagles while honoring the Eagles of the past.